Nice is more than just nice. This seaside French city is beautiful, energetic, cosmopolitan and the gateway to the hugely popular French Riviera. Situated on the Mediterranean Sea, it is one of those rare cities, where one minute visitors can be touring numerous art galleries, and the next minute soaking up in the sun on the famous beach next to Promeande des Anglais and enjoying a splash in azure blue water, which is famous the world over for its intense colour. The heart of the city of Nice is just ten minutes away by taxi from France’s second largest airport – Nice Cote d’Azur International Airport. Either jump in a cab or take a bus into the centre of Nice and you will be sipping a chilled glass of rose in Place Massena in no time at all. To get around Nice there is a recently completed tramline. Alternatively, you can take the Velib – an almost-free bike system spanning the whole city. Use their app (available for a variety of smartphone platforms) to find where the nearest available bicycle is and where you can park it once you are done. You’ll be spoiled for choice when it comes to deciding on where to rest your head in this popular tourist destination, which is busy all year round. There is something for every taste, and every budget. There are some excellent luxury hotels along the seafront, such as Negresco or Boscolo Hotel Plaza, as well as some excellent budget hotels. Trip Advisor apps can help you choose among a large array of hotel options. Alternatively, you can stay in an apartment, either directly via the owner (through Airbnb, for example) or with an agency, of which there are many. We advise you to ring up ahead of time using your prepaid sim card in Europe as accommodation in this city does tend to fill up quickly, especially in the summer months. If you do not have a prepaid sim card for Europe, you can buy an international sim card online with TravelSim. There are literally restaurants and cafes everywhere you turn in Nice, offering a huge range of cuisine from French to Finnish, from Korean to Cantonese. For local recommendations try the Michelin Guide here or the reputable Time Out Guide to Nice here. Nice has a surprisingly large number of art museums which are highly recommended, such as the Musee d’Art Moderne, the Musee Matisse and museum, dedicated to a worldwide famous Belarusian artist -the Musee Marc Chagall. It is also a great place to do a spot of shopping, with a large number of designer boutiques such as Chanel, Armani, Hermes and Max Mara all within a few feet from each other. 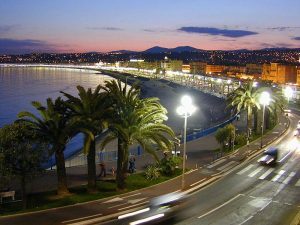 But perhaps the best thing to do is to wander along the Promenade des Anglais, where there is more than 5km of beachline. Choose a private beach and enjoy the luxury of a lounger and some excellent Mediterranean seafood for lunch.